So you may have noticed in the latest page that Si seems to have acquired a sudden knack for crazy free-running shenanigans. Si herself hasn’t noticed this yet, of course, but I’d like to pause in this moment between action and realisation to talk about the R1 button in Assassin’s Creed and how utterly silly it is on a conceptual level. What separates a gamer from your regular citizen is their capacity to forgive utter nonsense in their virtual worlds. Small things that completely break the immersion of anyone being introduced to video game worlds for the first time are water off a duck’s back for those of us who grew up inside them. I wonder sometimes what that does to a person’s psyche – I mean, we all coast on pre-conceptions that’d be utterly nuts to a visiting Venusian because “that’s just the way things are,” but when one of those pre-conceptions is the ability to scale a wall, tightrope-walk along a rooftop, balance on a church steeple on tip-toe and somersault off into a conveniently-placed haystack just by holding down a shoulder button and pressing forward…that can’t be healthy, can it? There’s been a spate of media recently that celebrate the gaming generation as a new cadre able to imagine the impossible and push the boundaries – one of which is storming the box office for strange and unfathomable reasons – and as refreshing a change as it is from the usual fuddy-duddy fearmongering, it comes at an awkward time when some decent old-fashioned fearmongering might do the self-declared “gamer” demographic a world of good. Plato was worried about the effects depicting a fantasy would have on the actors portraying Homer’s epics, and as much as we roll our eyes at the ancient world’s ur-Mary Whitehouse, my mind dwells on the unable-to-figure-out-how-razors-work folk harassing feminists for reasons invented for them by bigots and swallowed wholesale, and I wonder if maybe the philistine totalitarian had a point. 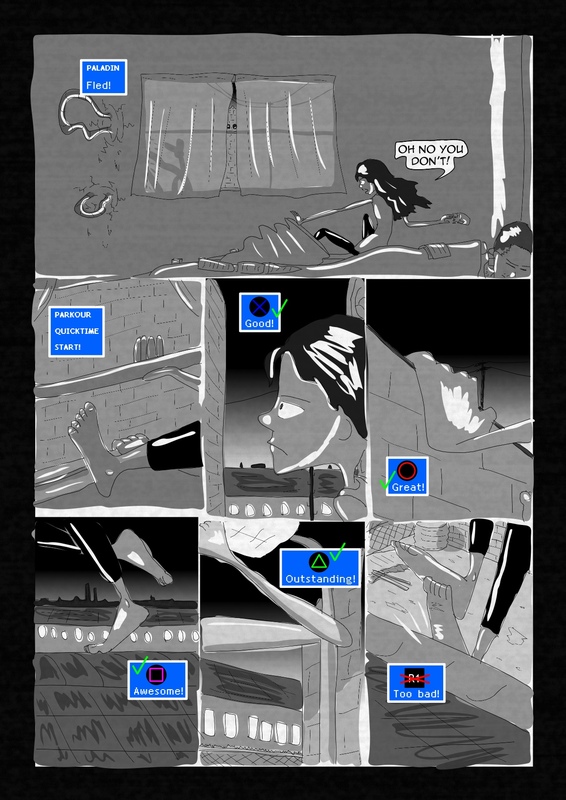 So here in these pages we see the “eyes” of our comic going through a metamorphosis, gaining an open-world sandbox UI and doing the impossible with some button-mashing totally alienated from the contortions her body is making. The world’s solidity has been stripped away and its polygonal debug mode superstructure has been exposed. What does that do to a person? We’re going to find out over the course of this adventure.